In his address to the US congress on 8 June, Prime Minister Narendra Modi called for a strengthening of the ties between Washington and New Delhi. 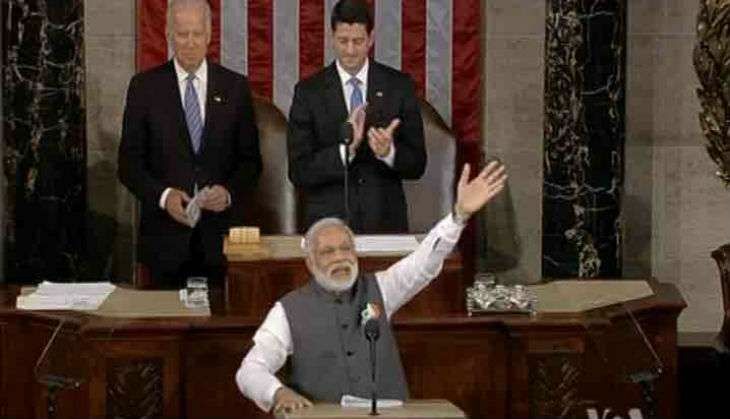 In his 45-minute long speech, which was enthusiastically received by the US lawmakers, PM Modi spoke about a number of issues - including yoga, terrorism, India-US strategic ties, economy and civil nuclear cooperation. "SIRI (an iPhone programme) tells us that India's ancient heritage of Yoga has over 30 million practitioners in the US. It is estimated that more Americans bend for yoga than to throw a curve ball". "No wonder then, that former Prime Minister of India Shri Atal Bihari Vajpayee called India and the US 'natural allies". "Terrorism is being "incubated in India's neighbourhood". Humanity must speak in one voice. Terrorism must be delegitimized". "I commend the members of US Congress for sending a clear message to those who preach and practice terrorism for political gains". "India will never forget the solidarity shown by US Congress when terrorists from across our border attacked Mumbai in 2008". "You are well-known for your bipartisanship. I have also witnessed a similar spirit in Indian Parliament, especially in Upper House". "India applauds the great sacrifices of the men and women from 'The Land of the Free and the Home of the Brave' in service of mankind". "India's strong economy and growth rate of 7.6% per annum, is creating new opportunities for our mutual prosperity". "India lives as one; India grows as one and India celebrates as one". "For my government, the Constitution is its real holy book. And, in that holy book, freedom of faith, speech and franchise, and equality of all citizens, regardless of background, are enshrined as fundamental rights".